When an act of terrorism or a vehicle or industrial accident ignites fuel, the resulting fire or explosion can be devastating. Today, scientists will describe how lengthy but microscopic chains of polymers could be added to fuel to significantly reduce the damage from these terrifying incidents without impacting performance. The project was motivated by the September 11, 2001, terrorist attacks. On that day, passenger planes loaded with fuel were crashed into the Twin Towers at New York City's World Trade Center. The impact set off a chain of events that ultimately brought down the buildings, Julia Kornfield, Ph.D., says. When the planes struck the buildings, their fuel turned into mist. Ignition of the mist blew out hundreds of windows (providing more air to feed the fire), ruptured concrete membranes between floors and stripped insulation off steel beams, she says. If fuel misting hadn't occurred, the initial destruction wouldn't have been as severe, and the buildings might have been able to withstand the lesser damage, says Kornfield, who studies polymers and flow behavior at the California Institute of Technology. 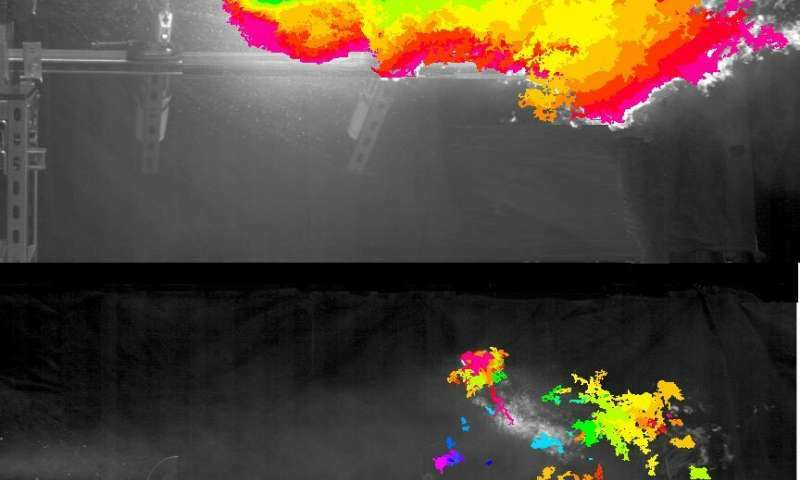 Other researchers pursuing this goal have developed "ultralong" polymers that can diminish the outcome of an impact, resulting in cooler, shorter fires. However, ultralong polymers aren't very practical because they interfere with engine operation, Kornfield notes. They also irreversibly break down into smaller molecules when they run through pipelines or pumps, losing efficacy. As an alternative, her team created polymers that can reversibly link up end-to-end via carboxylic acid and amine groups to form "megasupramolecules," which are as long as ultralong polymers but don't break apart in pipelines or pumps. The researchers, who created videos about the work, cofounded the startup company Fluid Efficiency to further develop the polymers and provide samples for evaluation to petrochemical companies, lubricants producers and pipeline operators. Results have been encouraging. Misting was significantly reduced in fuel treated with the polymers, and after the fuel was ignited, the flame self-extinguished. A recent test suggests that megasupra-molecules added at a refinery or fuel depot would remain active after passing through more than 600 miles of pipeline and hundreds of pumps, Kornfield says, noting ultralong polymers would have lost most of their potency after 50 miles. "This is an important step toward providing an additive that could improve transportation safety for all users receiving fuel through a pipeline network without concern that protection was lost in transit," she explains. Kornfield's molecules have other advantages. They enhance lubrication and flow through pipelines and hoses during fuel distribution. Because the polymer molecules' hydrocarbon backbone resembles that of fuel, they remain soluble even at low temperatures. In addition, the molecules break up into smaller ones when they pass into engines and burn with the fuel, so they don't interfere with engine performance. As an unexpected bonus, the additive reduces soot formation by diesel fuel engines by 12 percent, according to preliminary testing at the University of California, Riverside. At present, the polymers would add a penny or two to the cost of a gallon of fuel, which she says is a bit costly. They would like to collaborate with partners who can reduce the price and test the molecules' performance with a variety of fuels. The U.S. Army plans to study the utility of the additives in scenarios involving various impacts and projectiles such as improvised explosive devices. More information: Mitigating post-impact energy release from liquid fuels, the American Chemical Society (ACS) Spring 2019 National Meeting & Exposition.